This past week saw very little in the way of visible change, at least from the perspective of my photos, but the gravel pile shrunk by 50%, so something must have happened. Actually, the main change was that new footings were dug for walls that have evolved from drywall to masonry. I took some pictures from those footing holes, but not of those footing holes. Doh! In any case, the new wall design will give us better acoustics (isolation) and better aesthetics (consistency and integrity), and because the walls are so small, not much more cost. As a rule, I hate unnecessary volume levels at most concert venues. And I am no fan of recorded music that is compressed to sound as loud as a TV commercial. So it is with some ambivalence that I read No Fortissimo? in the New York Times this weekend. My mother was a professional violin player some years ago, and she attributes her hearing damage to not protecting her ears when seated too close to the trumpet section. I don’t know, but I do know that I basically avoid amplified musical performances of any kind due to the fact that nobody seems empowered to control the volume in any sensible way. I do understand the need for some sound reinforcement, and when it is done tastefully, that’s OK. But that, too, is becoming rare. But what will become of the symphony without fortissimo? That’s a tough one, but I’d rather see one cannon of music pushed to the back shelf than the canons of music making us all deaf, ruining everything for everybody. 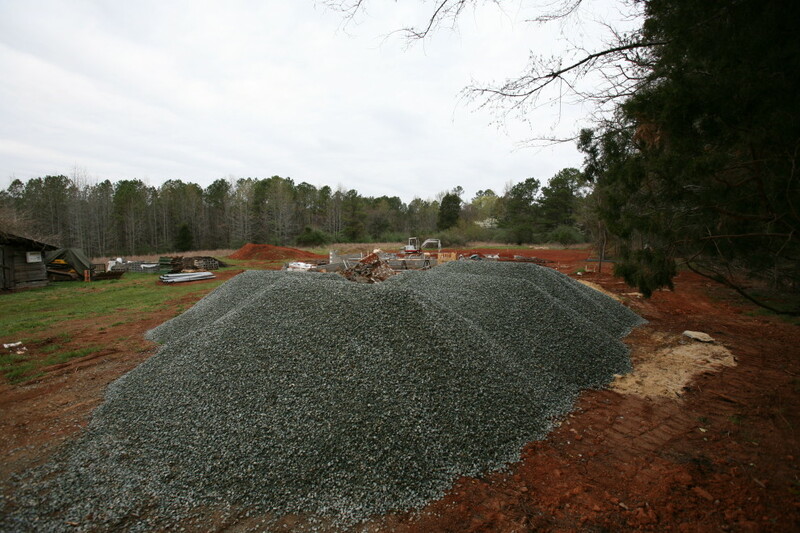 This week marks an important milestone in the progress of pouring the slab: the gravel is in! Author Michael TiemannPosted on April 12, 2008 Categories +1/-1, culture, Miraverse, music industryLeave a comment on If you were famous for 15 people, what would you do? In the past two weeks the Triangle got something we’ve been needing for a year: lots of rain. Good for the plants and the earth, not so good for construction. But with now nearly 12″ of rain replenishing the groundwater (and 12′ or more of water runoff filling the local reservoirs), we were happy when the rain stopped and the crew could get back to work.